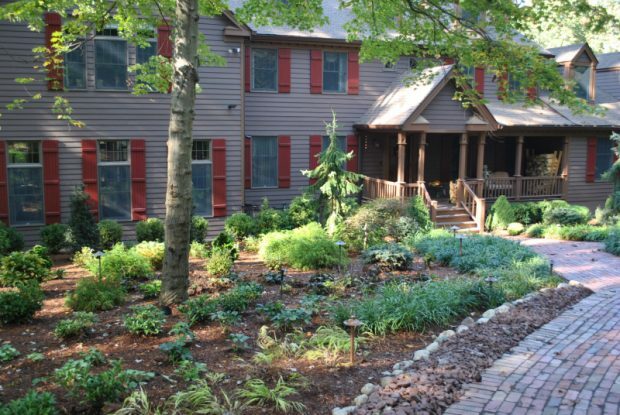 Can Landscaping Improve Home Value? Landscaping and improving your backyard has innumerable benefits, but can adding lighting, trees and other features to the area around your house increase home value? The short answer is yes, however there are many aspects of landscaping and yard design that must be taken into consideration if your goal is to tailor your space to meet your personal desires as well as appeal to potential buyers. First impressions form a mental image that lasts longer than follow-up observations. When it comes to your home, the first thing that people notice about a potential real estate investment is the landscape. Making decisions about your yard design can affect more than just the impression given by your area though. Landscaping professionals bear in mind the details that make your space unique while remembering the bigger picture. They are better equipped to solicit advice that appeals to homeowners associations and the rest of your neighborhood. According to a university study, the right landscaping can add up to 28% more overall value to your home. Even subtle aspects such as placement, design and condition can add up to 7% to home value. Adding trees adds value. In addition to beautifying the scenery, well-placed trees serve a variety of uses including the provision of shade and blocking wind which can improve energy efficiency in the home. Trees help to maintain waterways by drinking excess water and prevent pollutants from entering community water supplies. Adding the right trees to your landscape can directly translate to added value. Besides reducing carbon dioxide, a healthy, mature tree, native to an area can increase the value of your neighbor’s home. Studies have shown large, correctly positioned trees can increase overall property sell prices and reduce time in the market compared to properties that lack similar additions. Just as landscaping with trees holds the benefits previously listed, indigenous plants and shrubs can be utilized in much the same way. Designing a property with native plants can be much more cost efficient in terms of maintenance than simply covering a yard in non-native grass. In places like Mesa, Arizona assorted cacti can increase a home’s value by $5000 and require much less water than a patch of grass occupying the same area. Strategically placing plants can prevent excess rainwater from seeping into basements and foundations. In metropolitan areas, they help control flooding in municipal sewer systems. Another landscaping feature, often cited by potential buyers as “essential”, is lighting. Many prospective buyers are encouraged by real estate agents to come by a neighborhood in the evening or nighttime to observe a home from a different perspective before closing. The right lighting can completely transform a home, highlighting its best features and showcasing beautiful natural and carefully constructed scenery. Well-placed lights serve the function of directing guests to a focal point. Most importantly they provide security and illuminate safe paths in the front and backyards of a home, leading to doors and points of interest. Studies have also shown that homes with increased lighting have a tendency to deter burglars. Some insurance companies even offer incentives through discounts to homeowners who reduce claims of theft and burglary by consulting with experts on increasing security through lighting. We have only scratched the surface when it comes to making an investment in landscaping and property design improvements. The most important thing to take away from this exciting idea is this- Everything mentioned so far requires expert knowledge and experience. That is why consulting a professional landscaper and a company with proven expertise in construction is your best bet for turning a house into your home and a backyard into a dream retreat.